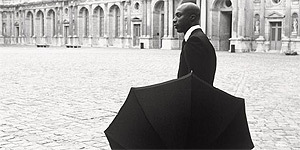 Documentaries about fashion designers tend to be fawning, ego-massaging affairs, and Varon Bonicos’ film about British menswear designer Ozwald Boateng proves no exception. Varon Bonicos spent 12 years documenting the highs and lows of British fashion designer Ozwald Boateng’s career for A Man’s Story. He starts in 1998 just after Boateng’s first business has gone bust and he is going through a messy divorce with his wife, but also charts Boateng’s subsequent success, as at 28 he becomes the youngest, and the first black British tailor on Saville Row and soon is being asked to helm Givenchy’s menswear collection as well as his own. Bonicos gets backstage access to both Boateng’s fashion shows but also to his family life, recording the impact his success has on his new marriage to Russian model Gyunel. Bonicos hops all over the world with Boateng from his Paris fashion shows to intricately-choreographed video shoots of his collection in China, to his London home, as well as to LA where he fits celebrity clients for their suits. He has good access to both the designer’s private and professional life and is no doubt helped in that his subject is a very suave and vivacious character. As you might expect from a designer, Boateng is utterly at ease with styling and branding himself on screen. Yet when he utters such criticisms as “they [Americans] all dress like kids”, we get a glimpse of the much more opinionated character that lies behind the charming facade. There are also plenty of interesting areas which Bonicos only glides over – in particular Boateng’s childhood and early years as a designer in London. He seems far too in awe of his subject; never once does he make an effort to challenge Boatweng’s views or his efforts to “save Africa with fashion,” as he puts on a show in Ghana. The greatest crime is that Boateng the designer and his craft are underserved. The clothes are observed swishing down the catwalk, but never do we get any insight into how these garments get from Boatweng’s mind to the shop floor. A Man’s Story is a missed opportunity. Hanging out with Ozwald Boateng for 98 minutes feels far too long as he is rarely probes about either himself or his profession, and as a result his film often resembles a drawn-out reality TV show.